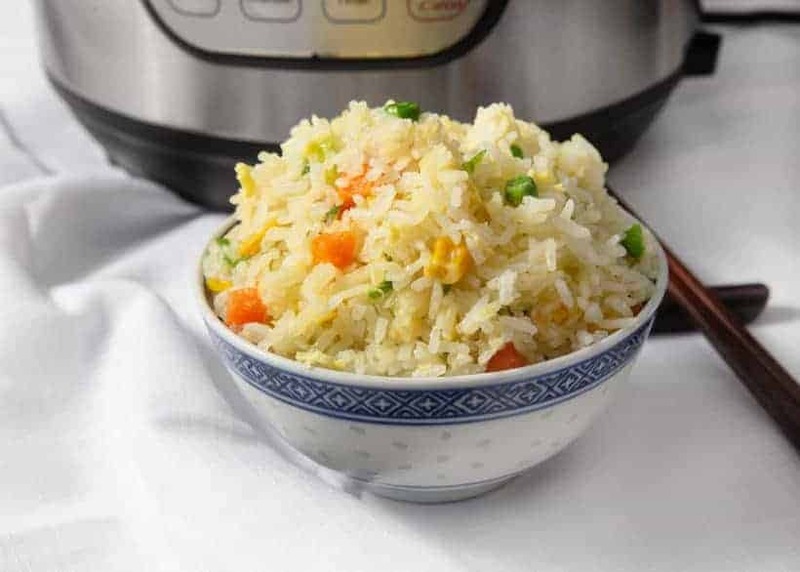 Make this Deliciously Easy Instant Pot Fried Rice Recipe (Pressure Cooker Fried Rice) with few ingredients from your pantry! 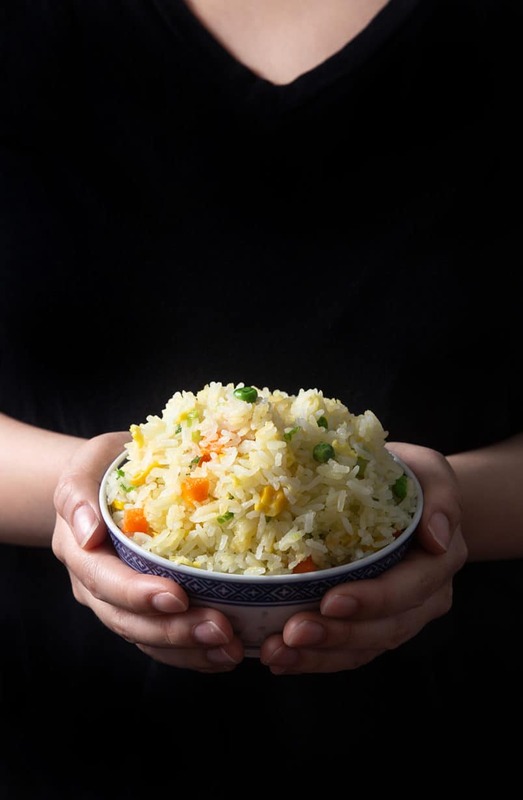 Fragrant Chinese Egg Fried Rice is a simple yet highly adaptable side dish or weeknight meal. It’s true. The Best Fried Rice comes from a piping hot wok. Chinese Egg Fried Rice is a simple food. So simple with such few ingredients that it can get tricky to be delicious. What We Look For in a Good Chinese Egg Fried Rice? Going back to the roots. Keeping it simple with a basic Chinese Fried Rice in Instant Pot with less than 10 ingredients. Real easy to adapt by throwing in your choice of add-in ingredients. We usually like to add bits of meat like chicken, ham, shrimp, cubed cured meat or Cha Siu (Chinese BBQ Pork) bits into this Easy Fried Rice. 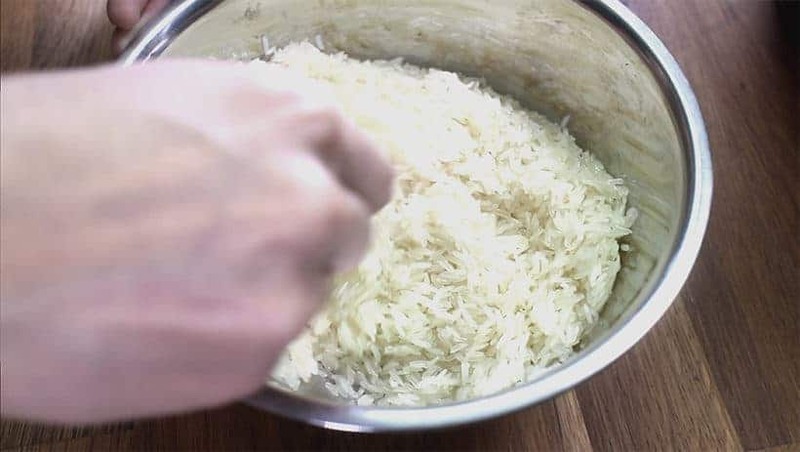 Pressure Cook Rice: Add 2 cups (460g) Jasmine rice + 2 tsp (10ml) peanut oil in a stainless steel bowl. Mix well so all the rice is covered with oil. Pour 1 ¾ cup (438ml) cold water in the rice bowl. 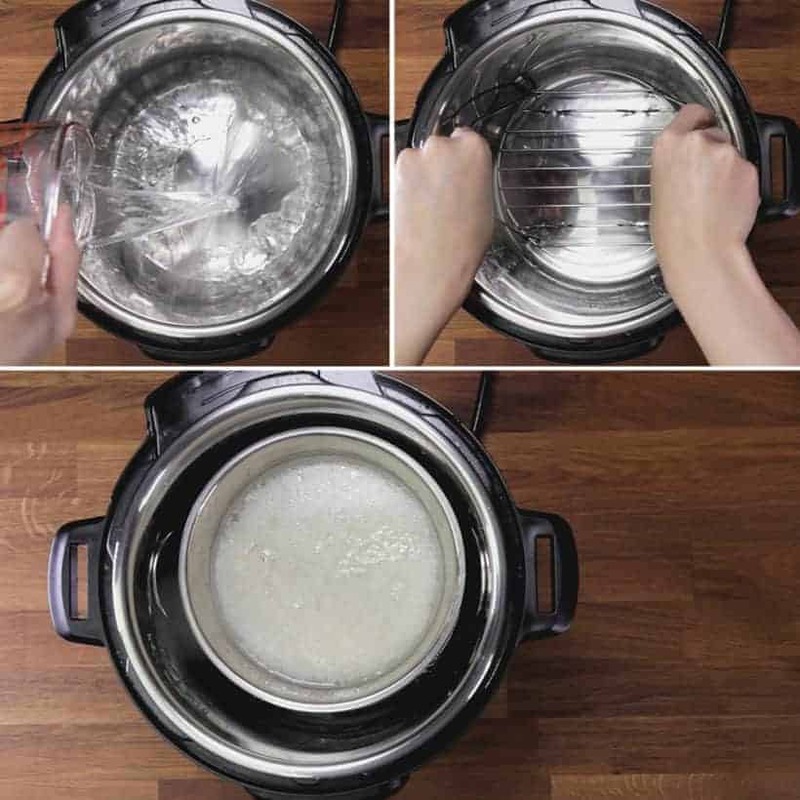 Ensure all rice is submerged in water.Add 1 cup (250ml) cold water and steamer rack in Instant Pot. Layer the rice bowl on rack. Pressure cook at High Pressure for 8 minutes, then 10 minutes Natural Release. 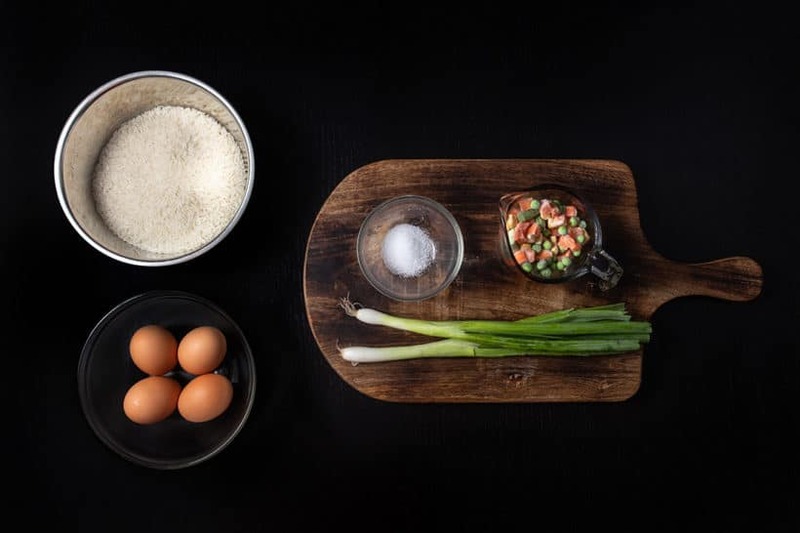 While rice is pressure cooking, prepare eggs and slice green onions. In a large mixing bowl, beat 4 eggs, then split half of the beaten eggs into another container. 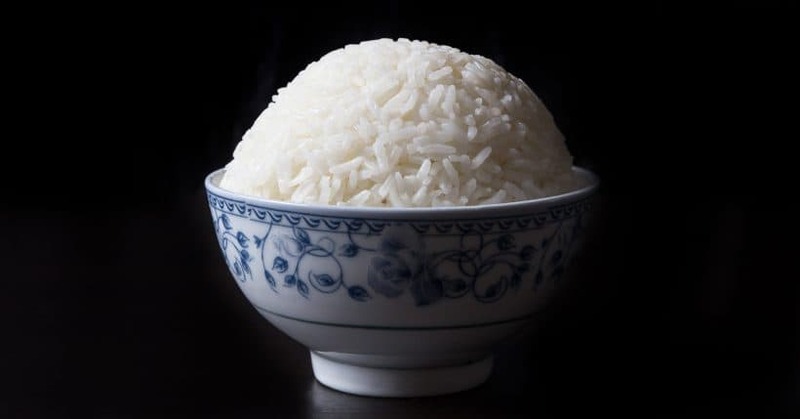 *Pro Tip: If you are rinsing the rice, ensure the rice is drained really well! Dry Inner Pot & Make Eggy Rice: Immediately add the piping hot rice in large mixing bowl with 2 beaten eggs. 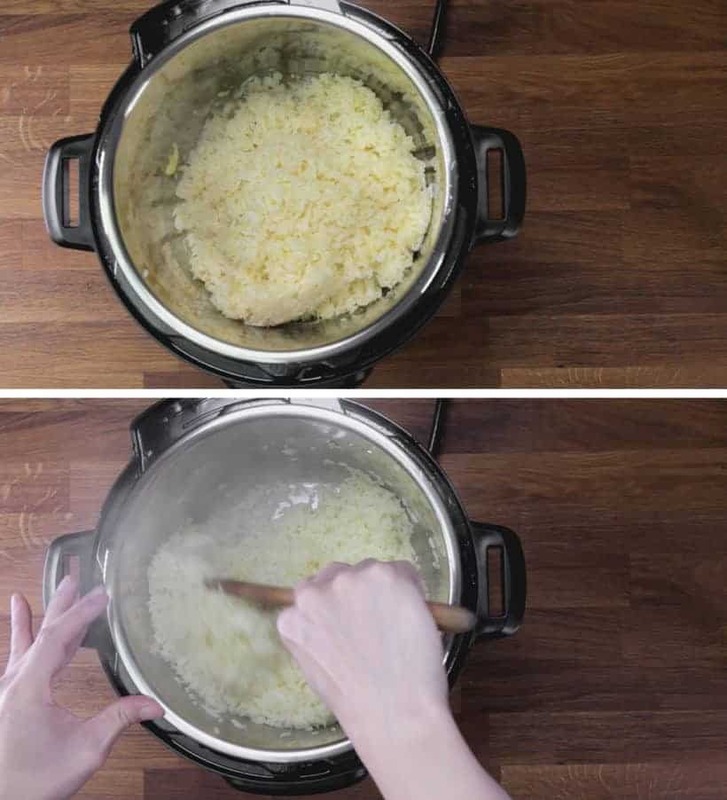 Mix the rice and eggs very gently until all the rice is coated with eggs. 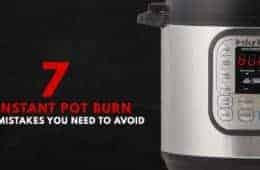 Discard the hot water in Instant Pot. Dry inner pot well with a towel. Cook Scrambled Eggs: Use Instant Pot Saute More function by pressing the "Cancel" button, then "Saute" button twice. 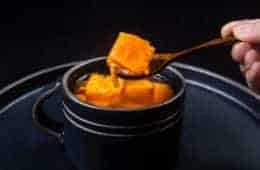 When Instant Pot says HOT, pour in 1 tbsp (15ml) peanut oil and wait another minute (ensure inner pot is piping hot, so the eggs won’t stick to the pot).Add in remaining 2 beaten eggs and give it a few quick stirs (ensure the eggs are slightly runny). Set aside the eggs. 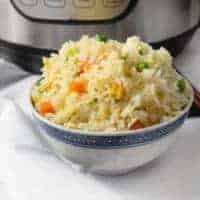 Cook Instant Pot Fried Rice: Wait until Instant Pot says HOT again (needs to be piping hot!) Add in remaining 2 tbsp (30ml) peanut oil and wait another minute. Add in cooked rice. Do not stir yet! Wait 1 minute before giving it a quick stir. Repeat this step 5 times. Ensure to wait 1 minute between each quick stir. *Pro Tip: You should hear some popping sounds and see some steam coming out of the fried rice after the fourth + fifth time. Make sure the stir-frying is done quickly, but gently. You don't want to destroy the individual grains. Add Ingredients and Season: Add in thawed frozen veggies. Mix and stir fry until veggies are hot (~1 ½ - 2 mins). Sprinkle in 2 tsp (10g) fine salt (taste & adjust). Add in a dash of white pepper and the scrambled eggs. Stir fry until thoroughly mixed. Add in sliced green onions and give it a few more quick stirs. Woohoo!! Your Instant Pot Fried Rice is done! Taste and add more salt if necessary. 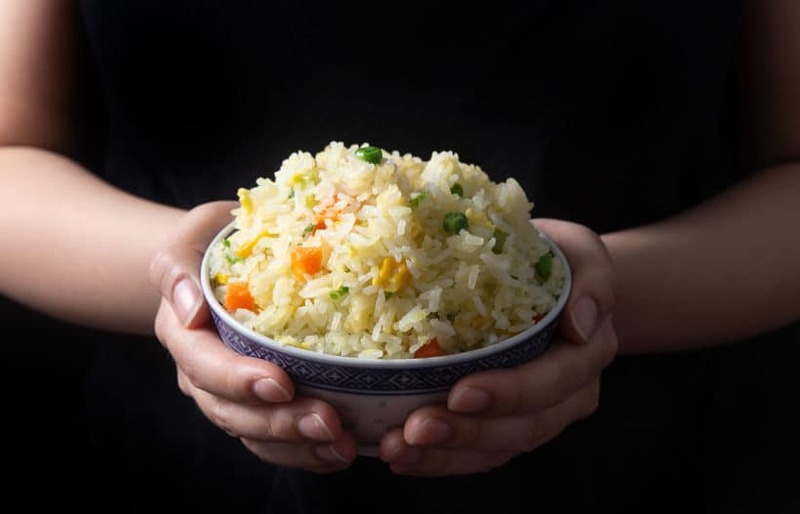 You don't need "day-old" rice to make tasty fried rice as long as you have the right Water to Rice Ratio to work it's magic! Slightly drier rice will hold up its texture better. 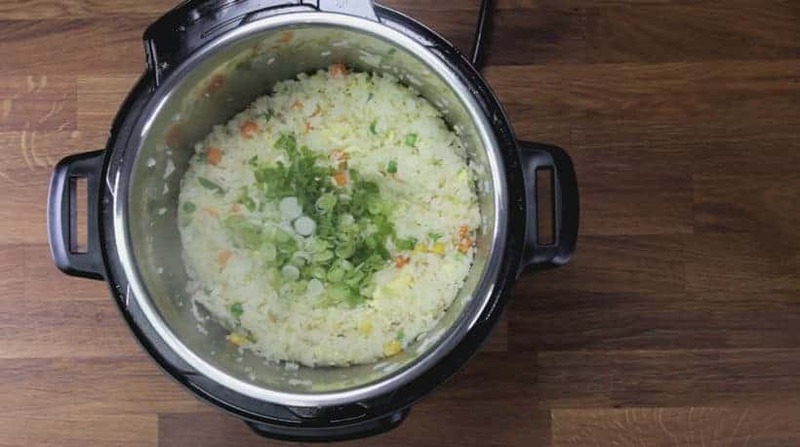 Prepare Ingredients for Instant Pot Fried Rice. First thing is to take out the frozen vegetables and thaw them on the countertop. 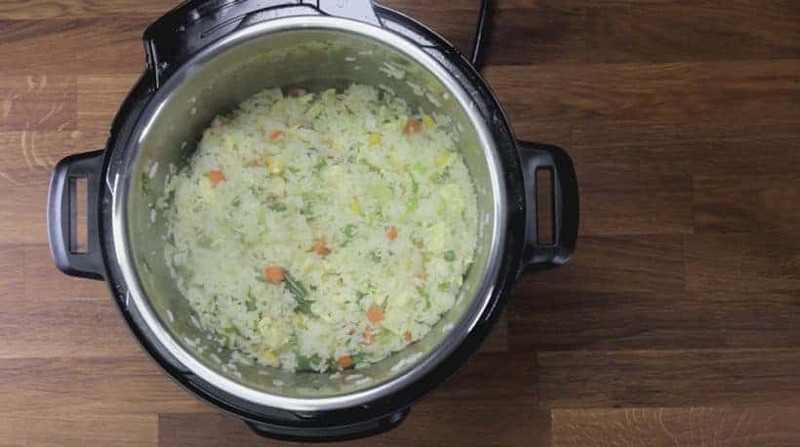 You can prep the remaining ingredients when the rice is pressure cooking in Instant Pot. 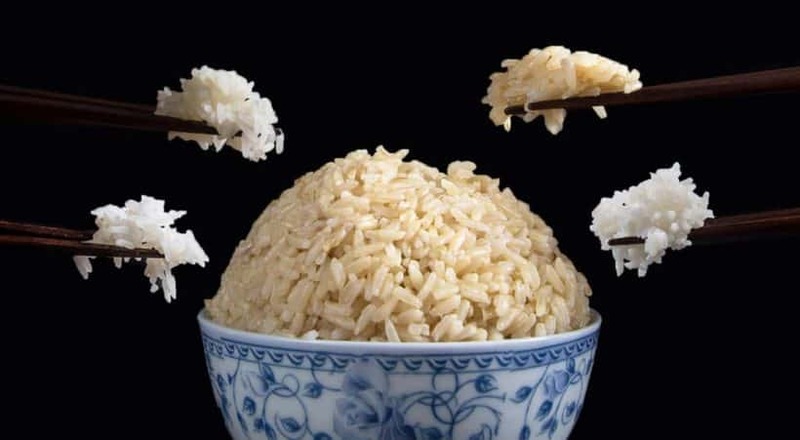 *Pro Tip: If you are rinsing the rice, make sure the rice is drained really really well! *Pro Tip: You don’t need “day-old” rice to make tasty fried rice as long as you have the right Water to Rice Ratio to work it’s magic! Slightly drier rice will hold up its texture better. Add 2 cups (460g) Jasmine rice + 2 tsp (10ml) peanut oil in a stainless steel bowl. Mix well so all the rice is covered with oil. Pour 1 ¾ cup (438ml) cold water in the rice bowl. Make sure all the rice is submerged in the water. Pour 1 cup (250ml) cold water and place a trivet in Instant Pot. Layer the rice bowl on the trivet and secure the lid. Turn the Venting Knob to Sealing Position. 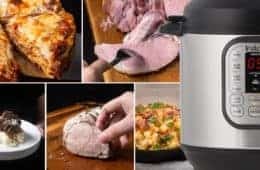 Pressure Cooking Method: Pressure cook at High Pressure for 8 minutes, then 10 minutes Natural Release. 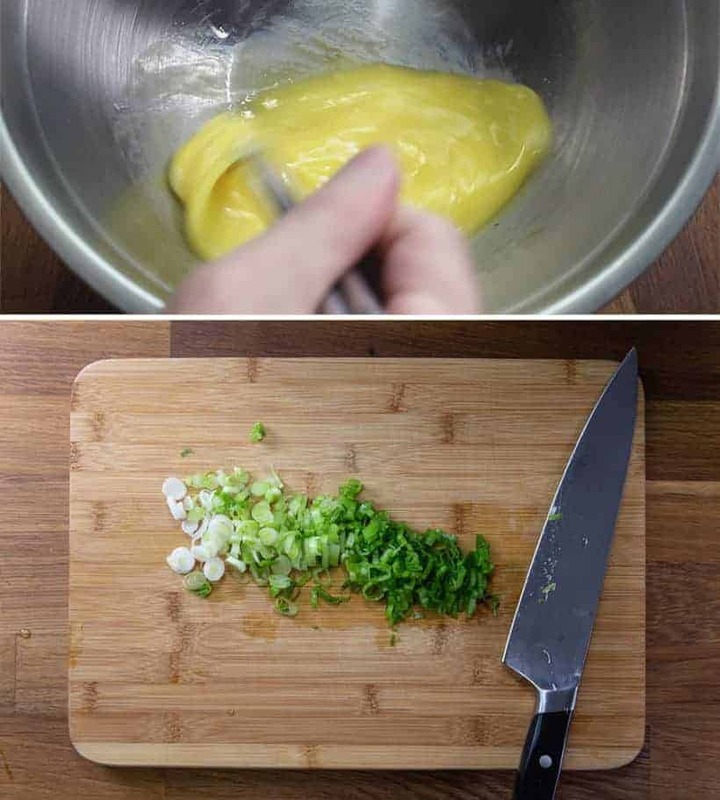 While the rice is pressure cooking, prepare the eggs and slice the green onions. 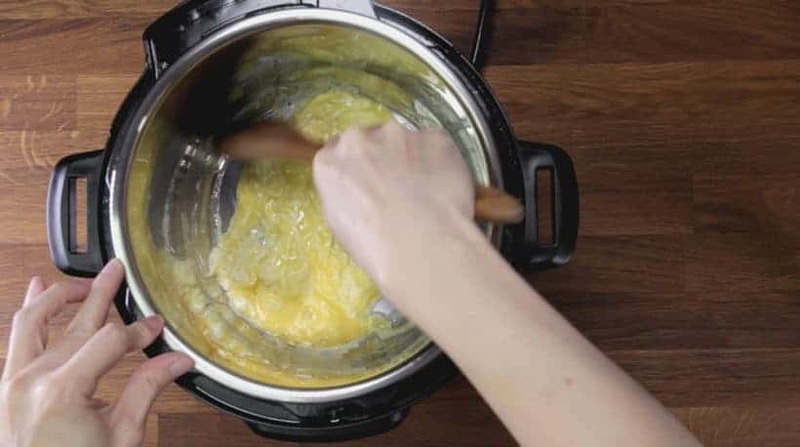 In a large mixing bowl, beat 4 eggs, then split half of the beaten eggs into another container. After 10 minutes of Natural Releasing, carefully turn the Venting Knob to Venting Position to release the remaining pressure. Immediately remove & add the piping hot cooked rice in the large mixing bowl with 2 beaten eggs. Very Gently! 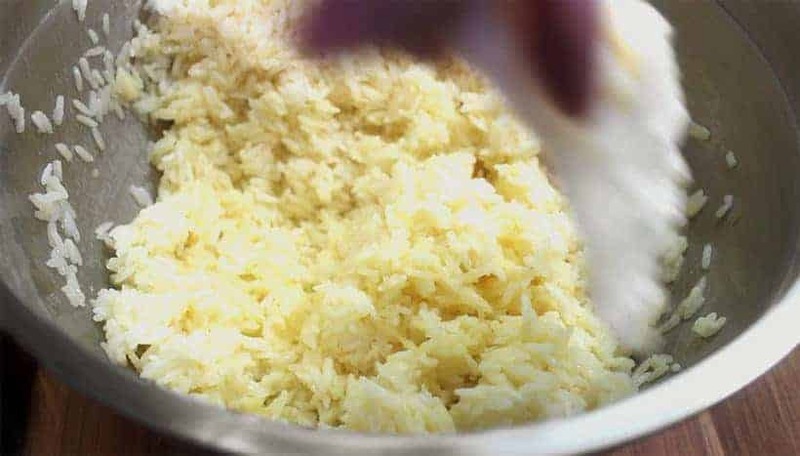 Mix the rice and eggs until all the rice is coated with eggs. 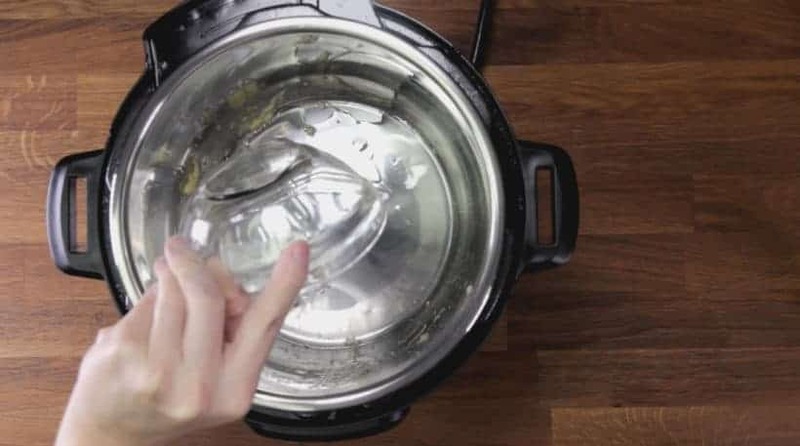 Discard the hot water in Instant Pot. 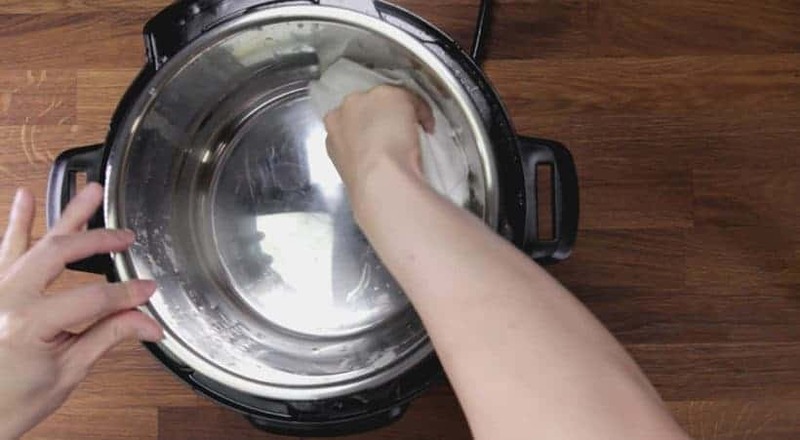 Dry the inner pot well with a towel. 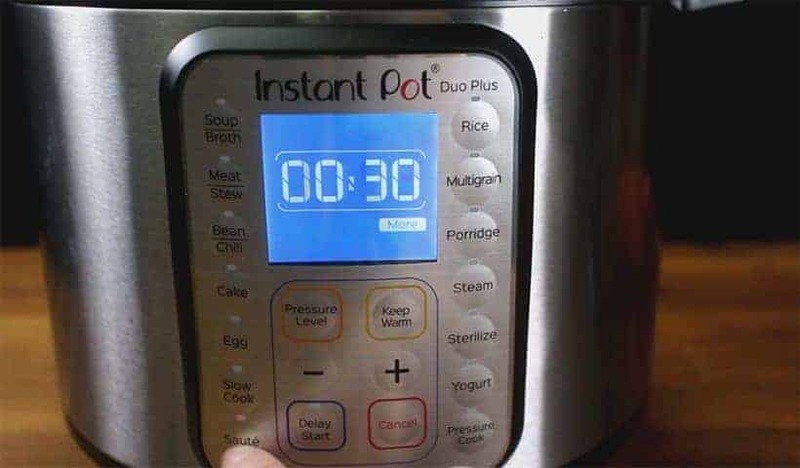 Use Instant Pot Saute More function by pressing the “Cancel” button, then “Saute” button twice. When the Instant Pot says HOT, pour in 1 tbsp (15ml) peanut oil and wait another minute. *Pro Tip: You will need the inner pot to be piping hot or the eggs will stick to the pot. Add in remaining 2 beaten eggs and give it a few quick stirs. *Pro Tip: You want the eggs to look silky and slightly runny! 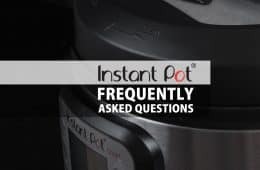 They’ll continue to cook a little after you’ve removed them from the Instant Pot. 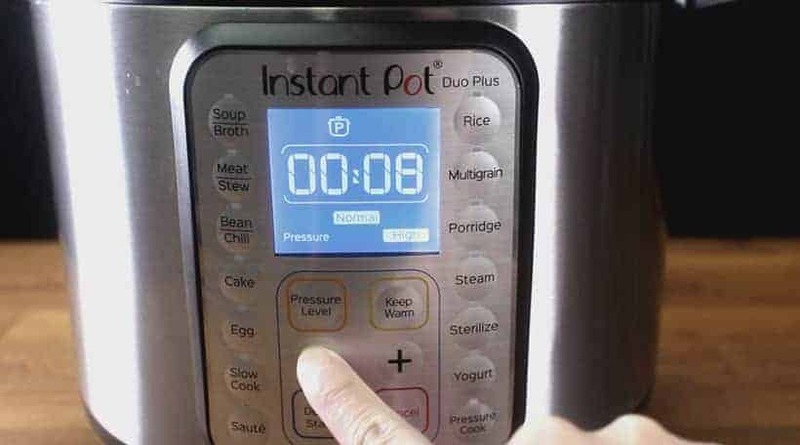 Wait until Instant Pot says HOT again. 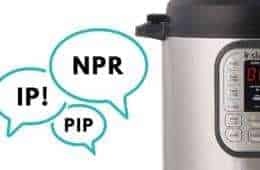 *Pro Tip: We need Instant Pot to be piping hot!! Add in 2 tablespoons (30ml) peanut oil and wait another minute. Add in cooked rice. Do not stir yet! Wait 1 minute before giving it a quick stir. *Pro Tip: Make sure the stir-frying is done quickly, but gently. Fried rice is all about the texture and you don’t want to destroy the individual grains or mash them together! Add in the somewhat thawed frozen veggies. Sprinkle in 2 tsp (10g) fine salt (please taste and adjust accordingly!) all over the rice. Add in a dash of white pepper and the scrambled eggs. Stir fry until thoroughly mixed. Finally, add in the finely sliced green onions and give it a few more quick stirs. Woohoo!! Your Instant Pot Fried Rice is done! I cook Cantonese style as my husband was from Hong Kong.I have difficulty giving up my trusty wok for fried rice. I still use my rice cooker as I usually have my instant pot cooking other things. I am not Asian but do love your adaptions to the instant pot. I intermittently teach a few Cantonese style foods to others. Thank you for your recipes and passion. For someone with a peanut allergy, what oil can be used? Thank you for your question. Vegetable oil will work fine. Hi! I am excited to try your recipes! 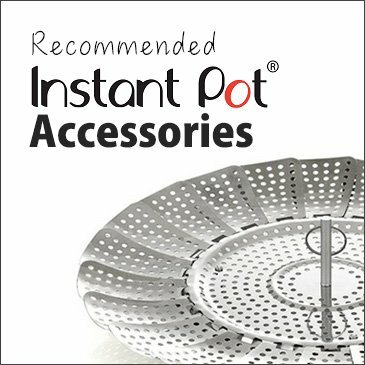 Would a stainless steel steamer basket work? The one im looking at is stainless with loots of little holes and fits in the instapot. Thank you for your question. The stainless steel steamer basket will not work as the rice will need to be submerged in the water to cook properly. I tried this 2 x and each time the rice did not cook in the stainless steel rice bowl. Can’t figure it out. I bought a rice bowl specifically for cooking rice in a bowl in the insta pot. And both times the water wasn’t absorbed and the rice grains still hard. Any words of wisdom? Thank you!!! Hi, thank you for your helpful and awesome recipes, I’m enjoying all of the food made! Is it possible to use a ceramic bowl to cook the rice initially instead of a stainless steel bowl in the first step? Thank you! Thank you for your question. If the ceramic bowl is oven-safe and has no fine cracks on the surface, it should work fine. Since ceramic bowl transfers heat slower, you will want to increase the cooking time by a few minutes. Most Asian restaurants here ask if you want white rice or “fried” rice with your order. A couple of days ago I wrote you about the dark “fried” rice option that contains only a tiny amount of onion and egg flakes. I don’t know how I overlooked your fried rice recipe on the site, but I have it now. 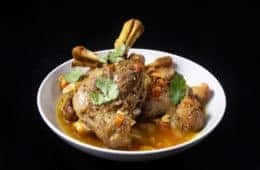 Although yours is the classic white version, I can use that as a base to make a mildly flavored dark version that won’t compete with the main dish. Can you suggest what to add to the cooking water, or to stir in after cooking, besides soy sauce to make a mildly flavored fried rice variation to use as a side dish? Dark soy sauce? Mushroom soy? Oyster sauce? Rice vinegar? Other? Or perhaps you already have a recipe along those lines? This is just one opinion, but I use braggs liquid aminos. I cannot use soy sauce and this has a taste that I can barely distinguish from soy. Thanks for all the work and sharing recipes ! Turned out great first time!!!! Do you have a Mexican/Spanish Rice recipe for the pressure cooker? We don’t have a Spanish rice yet, but it is on our to-make list! Amy and Jacky you have done it again. Fried rice is one of my all time favorites. This could not have turned out any better. I can not believe how easy this was to make. As always the instructions are so easy to follow. Thank you so much for your kind words and I am glad you enjoy this fried rice recipe! I just love your recipes ….I made this today and followed your instructions and it turned out great and tasted so good…….I also added some day old chicken to it with veggies …Love the recipes you have..so easy to follow….I cook for myself and am just loving how easy it is to make such good meals in ipot. Thank you and keep them coming. Happy to hear you enjoyed the fried rice! Excellent Recipe! I modified slightly using Brown Jasmine Rice and prior to scrambling the eggs, I sautéed red pepper and ginger. I seasoned with 2 Tbsp of soy sauce and 1 Tbs seasame oil. Just tested my IP yesterday and am excited to see your recipes. Leftover rice is fine as well. You can follow the recipe starting from step 2. Million times and I just can’t seem to get it right. 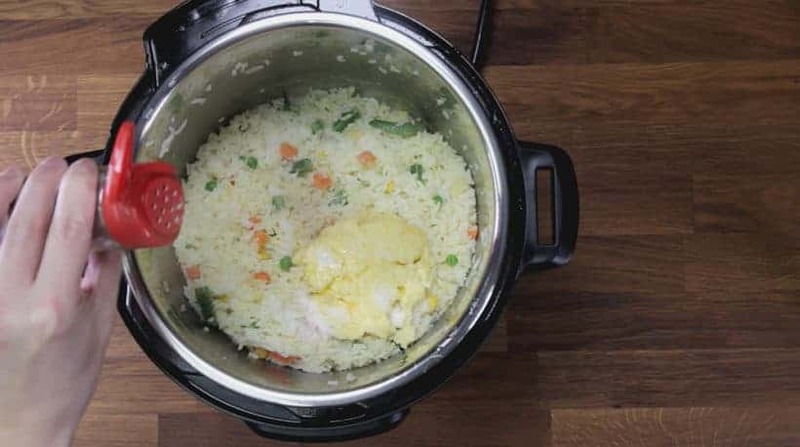 For this recipe, it is better to cook the rice separately in a container. For normal use, you can use these recipes as reference. Hi, is there something I can substitute for the stainless steel bowl? Unfortunately I dont have a smaller one that would fit the instapot. Thanks! An oven-safe pyrex glass bowl will work. You will want to add ~3 minutes to the pressure cooking time as glass conducts heat slower than stainless steel. Recipe looks amazing! I’m new to your site. I’m interested in the pot in pot stainless steel bowl. I only have the basic things that came with my instant pot. I didn’t see the size or where I could purchase one. Thanks, looking forward to trying some of your recipes! Made this as soon as I received the email about it. Yet another splendid recipe from you both! 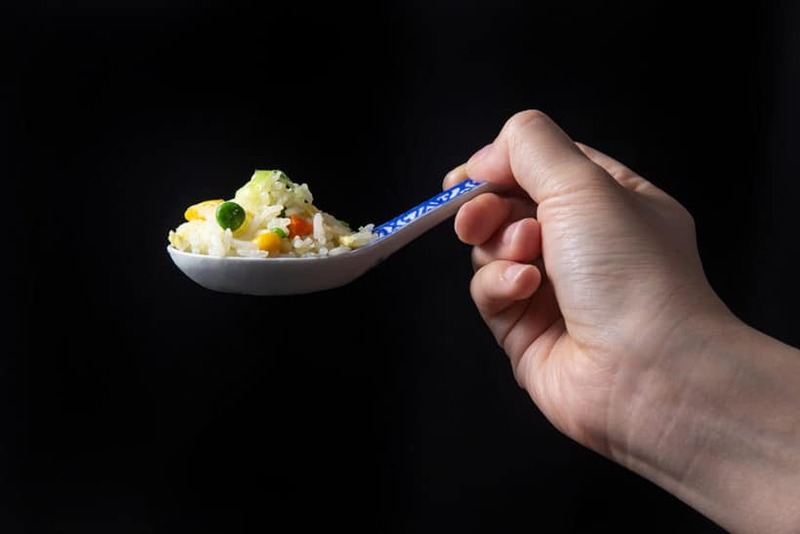 I did make 2 small adjustments – I added 1 teaspoon of carraway seeds to the rice before cooking (I just love how carraway flavours rice), and I added some fresh ginger and garlic at the time of adding my veggies at the end of the rice frying time. It was beautiful! I do have a question though – in nearly every recipe I’ve tried from you both, you usually use a soy sauce / fish sauce etc. for unami. In this recipe, you call for 2 teaspoons of fine salt. Why not use a tablespoon of soy sauce instead? Interested to hear your answer? Additionally, if I’m out of peanut oil, what’s the next best thing? Typically I had a load of toasted sesame oil – but I guess that’s more for dressing, so I made a blend of 50% olive oil / 50% sesame oil. Hehe great questions! We wanted to introduce the fried rice dish as basic & authentic as it can get on our first recipe. We will gradually go crazy with this method. Thank you so much for your kindness and support. We truly appreciate it!!! Would olive oil work as well? I don’t usually keep peanut oil. I suspect peanut oil is the standard in a Chinese kitchen. I do like to add a little sesame oil for flavor. Thank you for the specifics of how to make fried rice. Olive oil will work well in the Instant Pot. It will not work too well in a wok environment. For those of us who have the ultra, is the saute high? We don’t push twice therefore confussing! Yes Carol, Saute on high! You want the pan really hot. How is the Ultra? Did you have a Duo before getting it? I’m interested to hear about the differences? So happy to hear from you 🙂 Hope you are doing well & enjoying the weather. Hehe no fish sauce for this one. 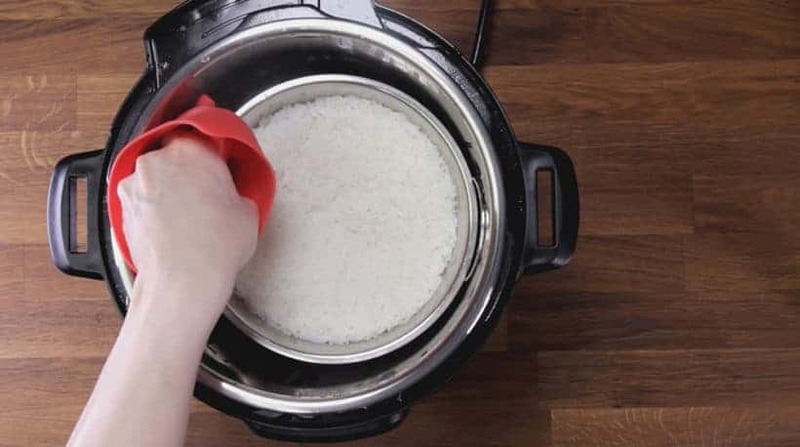 How do you drain the rice really really well after rinsing? 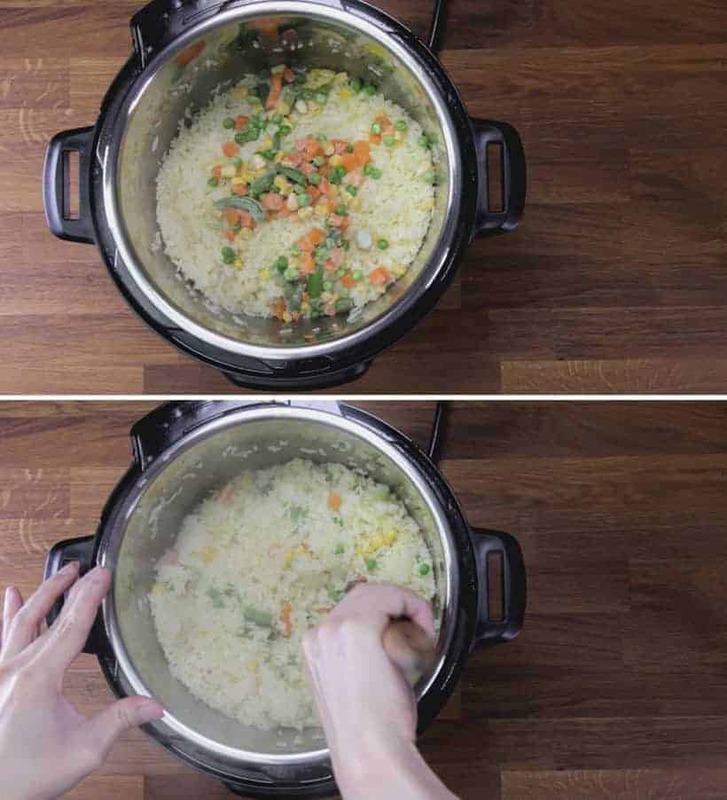 I usually just slide one palm under the water and hope to catch most of the rice, but at some point I just sacrifice the remainder of the water so that I don’t have to pick up grains of rice from the sink. 🙂 Any pro tips on how to drain rice well? A mesh strainer will work. I usually use my fine tea mesh strainer if I want to drain them really really well. Hi, if I would like to add in raw meat or spam, how should I do it? Thanks! For raw meat, you will want to season them and stir-fry them right before adding the rice. For Spam meat, you can just chop it up and add them at the frozen vegetable step.